>Qi Wireless Charging. Compatible with all Qi-enabled devices. > Vertical Stand, Watch movies or TV from multiple angles and the sturdy metal kickstand. >You can Charge Up to 3 Devices Simultaneously : 2*Wired charging + 1*Wireless charging. >Safe Charger with over-current protection, short-circuit protection, over-power protection, voltage-shortage protection. >Perfect battery pack for everyday use,travel,camping or hiking, emergencies, commuters and families. 1. The switch must be turned on before using wireless charger power bank. 2. Please completely full charge the power bank in first usage. 3. Keep the battery dry and away from moist and corrosive materials. 4. Please do not use case with metal material, such as metal ring holder, etc. 5. Wireless charging conversion rate will be lower than wired charging due to different charging technologies. 6. The protective case is normally suggested to be removed if it is too thick during charging as it will affect charging. 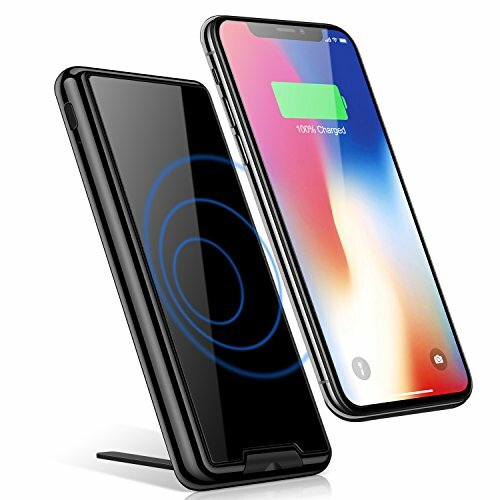 【WIRELESS CHARGING】- Wireless Charger with rechargeable Battery Integrates a high-power wireless charging transmitter and a large-capacity rechargeable battery;works as Wireless charging pad or a power bank on the go. Wired Charging Support all Smartphones and other Smart Devices. 【CHARGING FREEDOM】-HTGK 10000mAh Wireless Charger Power Bank allows you to charge your phone effortlessly and without cables. Simply place your Qi enabled device on the stand and it will begin charging. Works with the new iPhone 8, iPhone 8 Plus, iPhone X (iPhone 10), Samsung Galaxy S7/S8, Android and more. 【CONVENIENT AND PORTABLE】- Two input ports (Type-C + Micro USB）and Dual USB outputs design, indoor or outdoor there is no need to carry many cables,perfect for business trip or travel. 【PERFECT FOR HOME AND OFFICE】- We designed the charging stand to seamlessly fit into any decorating style to allow you to use this practical wireless charger at home and in your office. It is extremely easy to use as it only requires you to place your phone onto the stand. This simple design guarantees flawless performance, time and again. 【WHAT YOU GET】-HTGK Wireless Power Bank x1, Micro USB cable x1, User manual x1 and 12-Month warranty. In the process of using, any problems can be contacted with us directly. We will try our best to solve it for you. If you have any questions about this product by HTGK, contact us by completing and submitting the form below. If you are looking for a specif part number, please include it with your message.